SolAeroMed is a company dedicated to the development of novel therapeutic strategies to treat obstructive lung diseases. Our lead asthma drug is in Phase II clinical trials designed to demonstrate Proof of Concept. 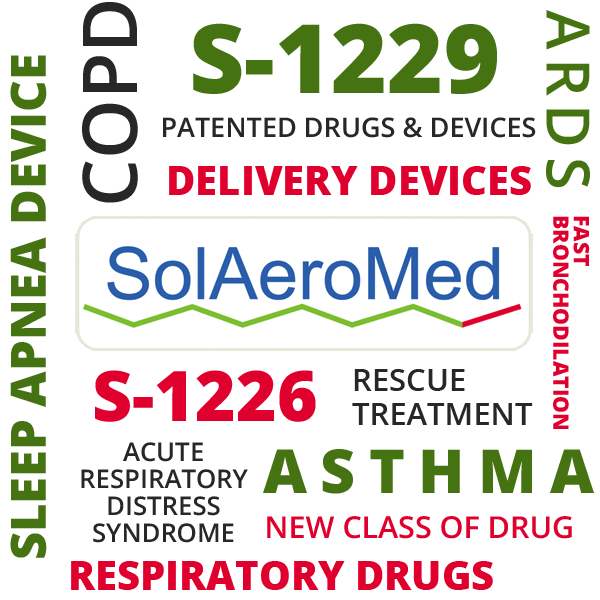 SolAeroMed seeks a development partner(s) for our $4-$6 Billion lifetime sales market as a new class of asthma drug and delivery device. Please contact us regarding investment options. The respiratory drug market remains one of the largest and most lucrative in the pharmaceutical industry with patient populations continuing to increase. There are large shortcomings in the current standard of care for acute airway constriction, which can be addressed by SolAeroMed technology (i.e. fast response, unique biological pathway, able to treat patients unaffected by other therapies, facilitate delivery of other treatments). Market pull for new respiratory therapies to be developed with strong surrounding IP as current blockbusters go off patent and generics enter. Our technology’s competitive advantages: an excellent safety profile, strong efficacy, mucolytic and mucous clearing properties, and combination/platform potential. The SolAeroMed management and board consists of a combination of experienced businessmen and physician-scientists who have decades worth of experience in respiratory treatments and have gone through the complex path to technology commercialization before. To view our most updated investor presentation, please contact us.